Sorry for the delay with the editing, here is the video footage of our exclusive interview with the Sailor Moon cast members who were at Anime North last year. There are quite a few interesting questions and answers in this video featuring Toby Proctor (Tuxedo Mask #2), Katie Griffin (Sailor Mars #1), John Stocker (Grandpa Hino, Voice Director #3), and Linda Ballantyne (Sailor Moon #3). This includes John Stocker’s confirmation that he was Grandpa Hino! Stay tuned for more video convention coverage featuring Sailor Moon talent at other events. European fans may be interested to hear about the appearances of Susan Roman (Sailor Jupiter), Toby Proctor (Tuxedo Mask #2), Katie Griffin (Sailor Mars #1) and Linda Ballantyne (Sailor Moon #3) at the Malta Comics Expo. Jennifer Cihi, who sang a number of songs for the English language soundtrack will also be appearing. The convention will be held October 31st-November 2nd at The Mediterranean Conference Centre in Valetta, Malta. Three day passes start at 31,50 € ($39.91 USD). Complete ticket information is available here. The complete lineup of guests is available here. For fans who attend — please share your experiences with us! We would love to see photos and hear about the first trip to a European anime convention for the Sailor Moon cast and one of the Sailor Moon singers! Here’s the second of the three public Sailor Moon panels that I recorded at Anime North this year. I missed a small bit at the beginning, but just think of lingering smells and you’ll figure it out. I am still editing the other videos from Anime North and will post as soon as they are processed. The third panel and our press interview will be coming up, so keep a lookout for them! This just in from an anonymous tip. Fans can watch the quick ad below which features Toby Proctor as a husband of a mother-to-be who makes the mistake of eating the last pickle. 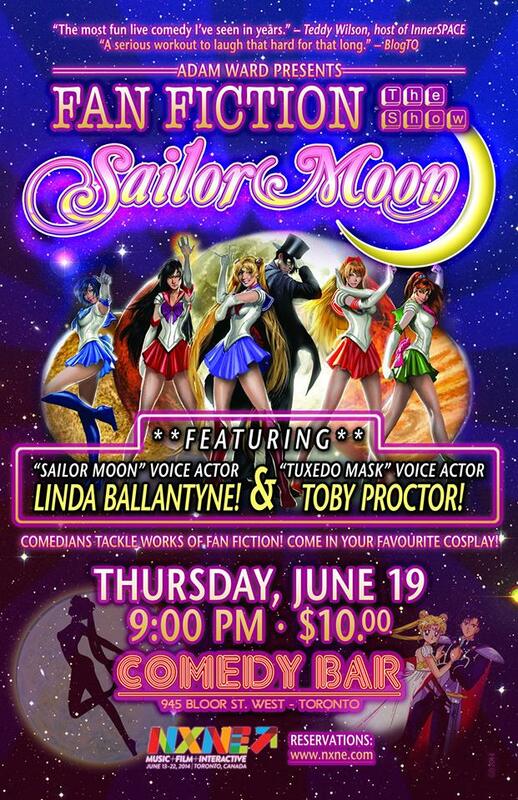 In case you missed the mentions on our Facebook page and you didn’t hear about this at Anime North – there will be a Sailor Moon themed comedy show on Thursday, June 19th in Toronto. Fanfiction the Show: Sailor Moon will be featuring both Toby Proctor (Tuxedo Mask #2) and Linda Ballantyne (Sailor Moon #3) this year. Toby also participated last year. At Anime North this year, Toby described it as a comedy show based on Sailor Moon fanfiction with some “blue” humour. He also mentioned that last year it featured Tuxedo Mask being on a dating show where he was asking questions of Sailor Senshi daters. For fans interested in catching the show next week, it will be at the Comedy Bar, located at 945 Bloor st. west in downtown Toronto (closest subway station is Ossington). According to the event page on Facebook, doors will open at 7:30pm. The poster indicates that the show is scheduled to start at 9:30pm. The start time has been updated to 9pm, as indicated on the event page on Facebook. I spoke with someone at the NXNE office, and she indicated that there are two ways for fans to get tickets for the show. You can either have an NXNE wristband (limited seats available) or you can purchase a $10 ticket at the door. The show organizer has also indicated that you can pre-purchase tickets via Comedy Bar (we suggest calling them as we couldn’t find a ticket ordering link on their website). The artwork featured on the poster, by the way, is by Stjepan Sejic. Edit: Start time of the show and ticketing information updated. Edit 2: Poster updated with new time.